Hundreds of people braved frigid weather in Greenpoint, Brooklyn, on Friday to watch Senator Bernie Sanders deliver a fiery condemnation of Wall Street and urge voters across the state to vote for him in record numbers. With his back to Manhattan’s skyline, the Vermont senator said he believed he would win New York’s April 19 Democratic primary and asked people in the crowd to help him by encouraging those close to them to cast ballots. 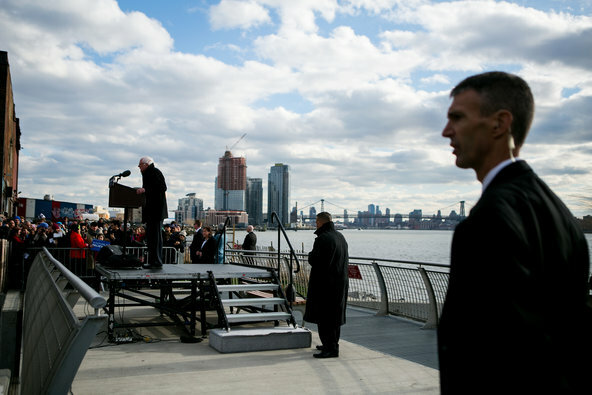 Mr. Sanders also reminded the crowd of his Brooklyn roots as part of his campaign’s strategy to beat Hillary Clinton.